There are many authentic ahaadeeth from the Prophet ﷺ concerned with the command to straighten the rows (for congregational prayer), so this is rarely hidden from any of the students of (Islamic) knowledge let alone their teachers. However it remains unknown to many that straightening the rows requires straightening it with the feet, not just the shoulders. 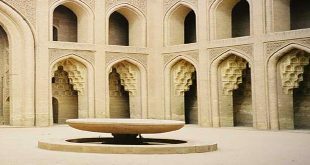 Indeed we have often heard some of the Imams of the Masaajid (Mosques) pointing out – when ordering the people to straighten the rows – that the Sunnah is to do so with the shoulders to the exclusion of the feet! Since this is contrary to what is established in the authentic Sunnah, I thought it necessary to mention some ahaadeeth that exist on this topic, as a reminder for whoever wishes to act in accordance with the authentic Sunnah, not being deceived by the widespread customs and habits present in the ‘Ummah. There are two authentic ahaadeeth on this topic: The first is the hadith reported by ‘Anas, and the second is that reported by an-Nu’maan ibn Bashir, may Allah be pleased with them both. “Straighten your rows and come close together, for indeed I see you behind my back”. “The call for commencing of salaah was made, the Messenger of Allah ﷺ turned to us and said…” (then he mentions the above hadith). Its chain of narration (sanad) is also sahih according to the conditions stipulated by the Two Shaykhs (al-Bukhaari and Muslim). “The Messenger of Allah ﷺ turned to us and said …” (then he mentioned the above hadith). The sanad of this hadith is sahih, al-Bukhaari quoted it in discontinuous (mu’allaq) form in a decided manner (indicating that he considered it authentic). Ibn Khuzaymah also connected its chain of narration in his sahih [1/82,83] and al-Mundhiree [at-Targheeb 1/176] and al-Haafidh [al-Fath 2/176] both confirmed this. Ibn Hibbaan selected the hadith in his Sahih [14/396 – Mawaarid] reporting through the tareeq of Ibn Khuzaymah. The text of the hadith is also reported by ad-Doolaabi by way of Baqeeyah ibnil Waleed who said: “Hurayz narrated to us saying: I heard Ghaylaan al-Muqri’ narrate from Abee Qutaylah Marthad ibn Wadaa’ah (who said: I heard) an-Nu’man ibn Basheer say …”, (then he mentioned the hadith). There is no problem with the sanad for the purpose of supporting reports (mutaab’aat), its reporters are reliable apart from Ghaylaan al-Muqri’ . Perhaps he is Ghaylaan ibn ‘Anas al-Kalbee (their mawlaa) ad-Dimishqee. If that is the case then his condition (as a reporter) is unknown. A group of the reporters have narrated from him and Al-Haafidh (Ibn Hajr) said about him: “He is acceptable (maqbool).” Then it became clear that identifying this reporter in the sanad as al-Muqri’ was a mistake, as al-Bukhaari and ibn Hibbaan had said, and that in fact he is Ghaylaan ibn Ma’shar al-Muqraa’ee [Lubab 3/237]. Ibn Abi Haatim [7/53] has given a biography for him, mentioning that a number of people have reported from him, and Ibn Hibbaan [5/290] declared him reliable. In these two ahaadeeth there are a number of important points of benefit and fiqh. It is regrettable that many Muslims have neglected this Sunnah of straightening the row, or rather they have lost it altogether, except for a few of them. For I have not seen this practiced by any group amongst them except Ahlul-Hadith (the People of the Hadith). I saw them in Makkah in the year 1368H enthusiastic and concerned with adhering to the Sunnah as with other Sunan of al-Mustafah (Muhammad the Messenger of Allah) ﷺ. This contrary to others from the followers of the madhaahib – and I do not exclude the Hanaabilah (Hanbalis), for this Sunnah has become utterly forgotten amongst them. In fact they have consecutively abandoned and turned away from it. 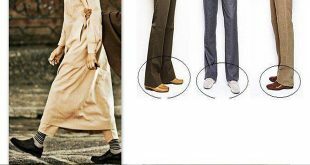 This is because most of their madhaahib state that the Sunnah in this regard is that a space of four fingers width should be kept between ones feet, and more than this is disliked, as is detailed in al-Fiqh ‘alal-Madhaahib al-Arba’ah [1/207]. This spacing has no foundation in the Sunnah; rather it is based on mere opinion. If it were correct then it would be necessary to restrict this practice to the Imam and the one praying on his own so that the authentic Sunnah (of standing close in the row) would not be opposed with this practice, as the fundamental principles of fiqh (al-Qawaa’id al-‘Usooleeyyah) necessitate. the Prophet ﷺapproved of their understanding and their practice. This is sufficient amongst Ahlus-Sunnah to affirm the legitimacy of this practice, because the witness sees what the absent does not, and the Companions are people whose followers will never be wretched (unsuccessful). In the first hadiththere is an affirmation of a clear miracle (mu’jizah) given to the Prophet ﷺ, and that was his ability to see behind him without turning his head. However it should be known that this was exclusively for the Prophet ﷺ when he was in Salah since nothing exists in the Sunnah that states that he used to see behind him without turning his head outside the Salah. And Allah knows best. (ii) the Prophet ﷺapproved of their understanding and their practice. This is sufficient amongst Ahlus-Sunnah to affirm the legitimacy of this practice, because the witness sees what the absent does not, and the Companions are people whose followers will never be wretched (unsuccessful). In the two ahaadeeththere is a clear proof for something that many people do not know about, although it has become recognized in the field of psychology, and that is the fact that outer (apparent) evil and corruption affects inner evil and corruption and vice versa. There are many ahaadeeth about this; perhaps we will undertake the task of gathering and referencing them at some later opportunity if Allah, The Most High, wishes. TRANSLATORS NOTE ~ Standing close in the row, filling the gaps and straightening the line carries a great reward and virtue as well as being obligatory. This is mentioned in a number of ahaadeeth, like the following: “The best of you are those who stand with their shoulders closest (to the one standing next to them) in the salaah, and there is no step greater in reward than that taken by a man toward a gap in the row thus filling it.”Reported by at-Tabaraanee in al-Awsat, refer to Saheeh at-Targheeb wat-Tarheeb (1/200).“Whoever fills a gap in the row, Allaah raises him up due to it a rank and builds a house for him in al-Jannah.”Reported by at-Tabaraanee in al-Awsat and al-Asbahaanee in at-Targheeb, the hadeeth is Saheeh as occurs in Saheeh at-Targheeb (no.505). TRANSLATORS NOTE ~ There are a number of ahaadeeth that explain the virtue of reviving the Sunnah and calling the people to guidance and righteousness. For example the Prophet (ﷺ) said: “Whoever calls to guidance will have the same reward as all those who follow him in that guidance but this will not take anything away from their reward. Whoever calls to untruth will carry the same sin as the sins of all those who follow him in that, but that will not take anything away from their sins.”Reported by Ahmad in his Musnad, Muslim in his Saheeh and others. TRANSLATORS NOTE — This article is taken from the newest edition.